The Russian painter and graphic artist Wassily Kandinsky was one of the great masters of modern art, as well as the outstanding representative of pure abstract painting (using only colors and forms) that dominated the first half of the twentieth century. Wassily Kandinsky was born on December 4, 1866, in Moscow, Russia. His father was a tea merchant. When he was five years old the family moved to Odessa, Russia. The young Kandinsky drew, wrote poems, and played the piano and the cello. Because his family was fond of traveling, Kandinsky got to see the Italian cities of Venice, Rome, and Florence as a young boy. He was also influenced by the imposing Muscovite (from Moscow) buildings such as the Kremlin. 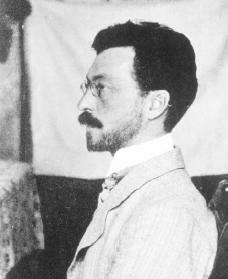 Between 1886 and 1892 Kandinsky studied law and economics at the University of Moscow. In 1889 he was a member of a team formed to study the life of the people in the Vologda district in northwestern Russia. He was highly impressed by their folk art and the interior decorations of the village houses. The use of forms and colors became an influence in his art. In 1893 he accepted a position on the university's law faculty. It was not until 1896, when Kandinsky was thirty years old, that he decided to become an artist. His artistic development was shaped greatly by an exhibition of French impressionist painters that was shown in Moscow in 1895. The impressionists used values of color and light to show their subjects rather than painting in fine detail. The works of Claude Monet (1840–1926) attracted Kandinsky's attention. In Monet's paintings the subject matter played a secondary role to color. It was as though reality and fairy tale were intermixed. That was the secret of Kandinsky's early work, which was based on folk art, and it remained so even as his work became more complex. The year 1910 was crucial for Kandinsky and for the art world. Kandinsky produced his first abstract watercolor. In that work all elements of representation (the actual look of a subject) seem to have disappeared. In continuing his early abstract works he used strong straight-line strokes combined with powerful patches of color. When World War I (1914–18; a war in which Germany, Austria-Hungary, and Japan fought against Great Britain, France, Russia, and the United States) broke out, Kandinsky returned to Russia. In 1917 he married Nina Andreewsky. During the Russian Revolution (1917), which overthrew the czar, the ruler of Russia, the artist held an important post at the Commissariat (government bureau) of Popular Culture and at the Academy in Moscow. He organized twenty-two museums and became the director of the Museum of Pictorial Culture. In 1920 he was appointed professor at the University of Moscow. The following year he founded the Academy of Arts and Sciences and became its vice president. At the end of that year, the Soviet attitude toward art changed, and Kandinsky left Russia. In 1922 Kandinsky became a professor at the Bauhaus (a school of art, architecture, and design) in Weimar, Germany. His art from about 1920 to 1924 has been called his architectural period because the shapes he used were more precise than before. There are points, straight or broken lines, single or in bunches, and snakelike, radiating segments of circles. The color is cooler, and more subdued (softer, quieter). Kandinsky became a German citizen in 1928. In 1929 Kandinsky held his first oneman show in Paris, France, and traveled to Belgium and the French Riviera. In 1930 he had another exhibition in Paris. In 1931 he produced wall decorations for a large architectural exhibition that was held in Berlin, Germany. When the Bauhaus closed in 1932, Kandinsky moved to Berlin. A year after that he moved to Paris. From 1927 to 1933, Kandinsky's paintings were characterized by abundant use of pictorial (like real pictures) signs and softer color. This is called his romantic or concrete period. It led to the last phase of his art, spent in France, which was a synthesis (blending) of his previous periods. The paintings of his Paris period have splendid color, rich invention, and delightful humor. In 1939 Kandinsky became a French citizen. He died on December 13, 1944, in Neuilly-sur-Seine, France. Kandinsky is still greatly admired today for his own paintings and for being the originator of abstract art. He invented a language of abstract forms with which he replaced the forms of nature. He wanted to mirror the universe in his own visionary world. He felt that painting possessed the same power as music and that sign, line, and color ought to correspond to the vibrations of the human soul. Bill, Max. Wassily Kandinsky. Paris: Maeght, 1951. Grohmann, Will. Wassily Kandinsky: Life and Work. New York: H. N. Abrams, 1958. Messer, Thomas M. Vasily Kandinsky. New York: H. N. Abrams, 1997. Overy, Paul. Kandinsky: The Language of the Eye. New York: Praeger, 1969. Weiss, Peg. Kandinsky and Old Russia. New Haven, CT: Yale University Press, 1995.